News story by Rick Steelhammer, courtesy of Charleston Gazette. 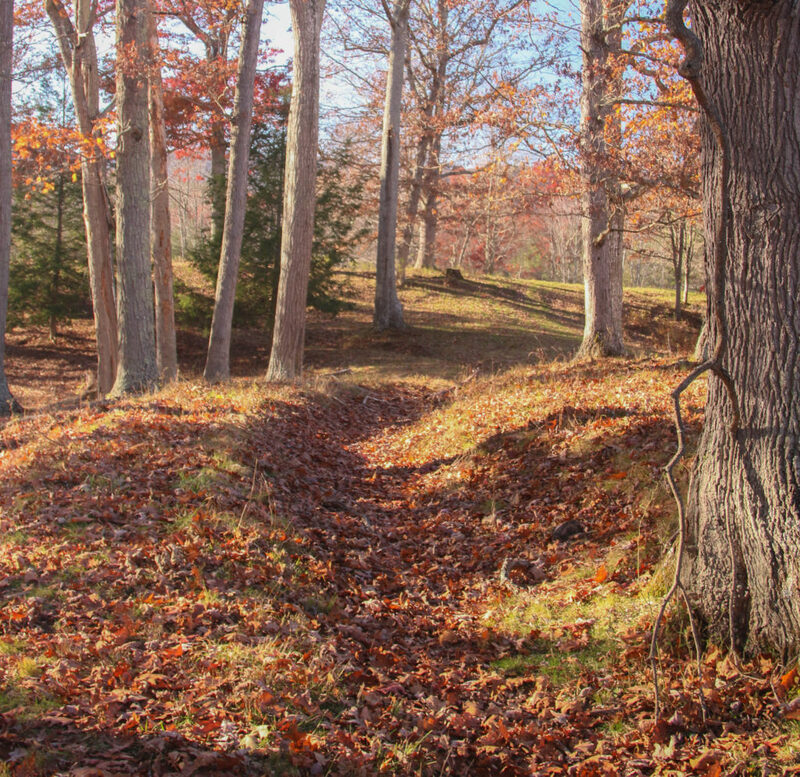 The core section of Camp Bartow, a fortified encampment with still-visible earthworks built by 1,800 Confederate soldiers, has been preserved and will eventually be opened to the public following its recent purchase by the West Virginia Land Trust. The encampment was built by soldiers from Georgia, Arkansas and Virginia who occupied the site for several months during the opening year of the Civil War, and it was used to fend off an attack by a much larger Union force during the Oct. 3, 1861, Battle of Greenbrier River. The 14-acre tract, bought with assistance from the national Civil War Trust, Pocahontas County Commission, state Division of Highways, Staunton-Parkersburg Turnpike Alliance and First Energy Foundation, overlooks the East Fork of the Greenbrier River and borders a still-used segment of the Staunton-Parkersburg Turnpike, a strategic east-west supply route during the Civil War. The site also overlooks Travellers Repose, a 19th-century inn serving Turnpike users that was torched during the Civil War but rebuilt on the same site a few years after hostilities ended. After being routed by Union troops at Philippi in June of 1861, defeated again at the Battle of Rich Mountain near Beverly on July 11 and losing their commanding officer, Gen. Robert Garnett, to enemy fire during the Battle of Corricks Ford at Parsons three days later, the Confederate Army of the Northwest, retreated eastward to Monterey, Virginia, to rest, regroup and review plans to return. In early August 1861, two Confederate brigades under the command of Brig. Gen. Henry R. Jackson returned to mountainous terrain of what is now West Virginia, marching into Pocahontas County on the Staunton-Parkersburg Turnpike. On Aug. 13, after descending Allegheny Mountain until the East Fork of the Greenbrier came into view, the Confederate force seized Travellers Repose and owner Andrew Yeager’s surrounding grazing land. In the weeks that followed, the southerners blocked passage on the turnpike to Union troops and commerce, built a campground atop a nearby hill and developed a series of trenches, cannon emplacements and firing pits along the contours of hills overlooking the inn, river and turnpike. Jackson named the beehive of Confederate activity Camp Bartow in honor of fellow Georgian Francis Bartow, an officer killed while rallying his troops during the Battle of Bull Run a few weeks earlier. “It is very rare to be able to preserve and protect a Civil War encampment and battle site that has remained the same for more than 150 years,” said Hunter Lesser, of Elkins. Lesser is the author of “Rebels at the Gate,” a history of the war’s first campaign, which took place in West Virginia between June and December 1861 and included battles at Philippi; Rich Mountain; Corricks Ford; Laurel Hill, near Belington; Cheat Summit, about 12 miles west of Camp Bartow; Camp Allegheny, about 6 miles east of the encampment; and the Battle of Greenbrier River, which took place at Camp Bartow. 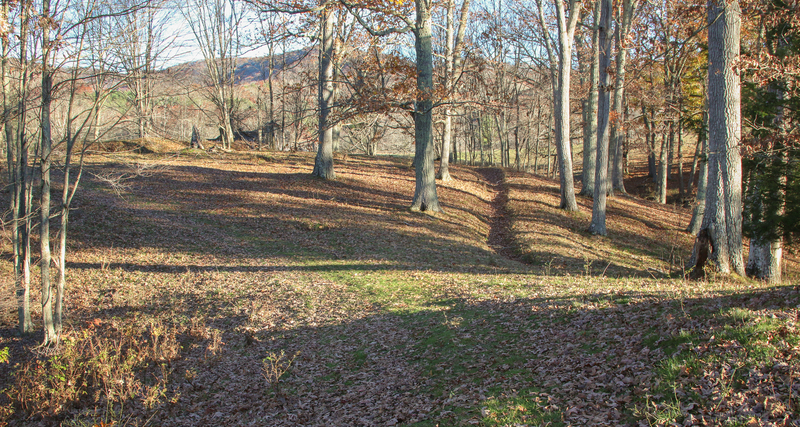 Camp Bartow, the site of the Battle of Greenbrier River on Oct. 3, 1861, had an added layer of protection by having been owned by the same family from the 1840s until 2013. Andrew Yeager built Travellers Repose, the first stagecoach stop on the Staunton-Parkersburg Turnpike west of Allegheny Mountain, in the early 1840s, and farmed the land surrounding it. After the inn was burned by bushwhackers in 1864, descendant Peter Dilly Yeager, a Confederate veteran and former prisoner of war, rebuilt a new inn on the foundation stones of the previous one five years later. In 1915, Jessie Beard Powell, a Yeager descendant, was born at Travellers Repose and married at the former inn 25 years later. After accompanying her husband, a Navy officer, through a career that included postings at bases around the world, the couple returned to the tranquility of Pocahontas County farm country. Powell outlived her husband and remained a fixture at Travellers Repose, as well as an advocate for preserving Camp Bartow, until she died in the former inn in 2013 at age 98. While the Monongahela National Forest owns and preserves a small section of the Pocahontas County battlefield, the original Yeager farm, encompassing most of Camp Bartow and the land on which the Battle of Greenbrier River was fought, was auctioned off and subdivided in 2014. While much of the former battlefield still consists of pasture land and forest, development possibilities remained active, so the West Virginia Land Trust and its partners worked tenaciously and diligently to secure titles to parcels containing most of the Confederate encampment’s earthworks and entrenchments. 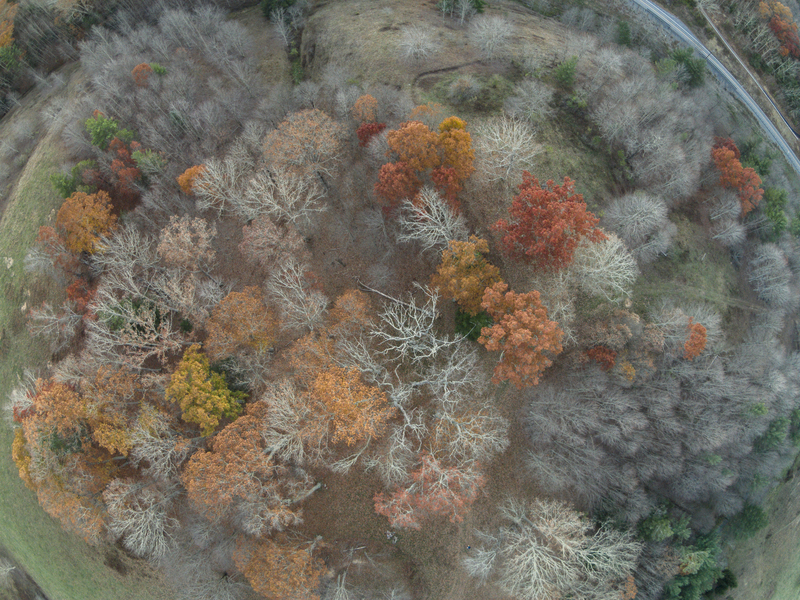 Camp Bartow served as the staging area for one of several regiments of Confederate troops taking part in the first attack of the war planned and led by Gen. Robert E. Lee — the Sept. 12, 1861, Battle of Cheat Summit Fort, an attempted siege of a nearby mountaintop fort occupied by Union troops. Lee’s battle plan turned out to be needlessly complex, involving a two-pronged simultaneous attack and an elaborate diversion provided by units arriving at the enemy fort from several different directions. Bad weather, poor communications and an uncoordinated series of assaults by the Confederates resulted in a victory for the greatly outnumbered Union garrison and in embarrassment for Lee. Union Brig. Gen. Joseph J. Reynolds attempted to return the favor on Oct. 3, when he led nearly 5,000 Union troops down the Staunton-Parkersburg Turnpike from the top of Cheat Mountain in a bid to surprise and overwhelm the 1,800 Confederate soldiers under Jackson’s command dug in at Camp Bartow. 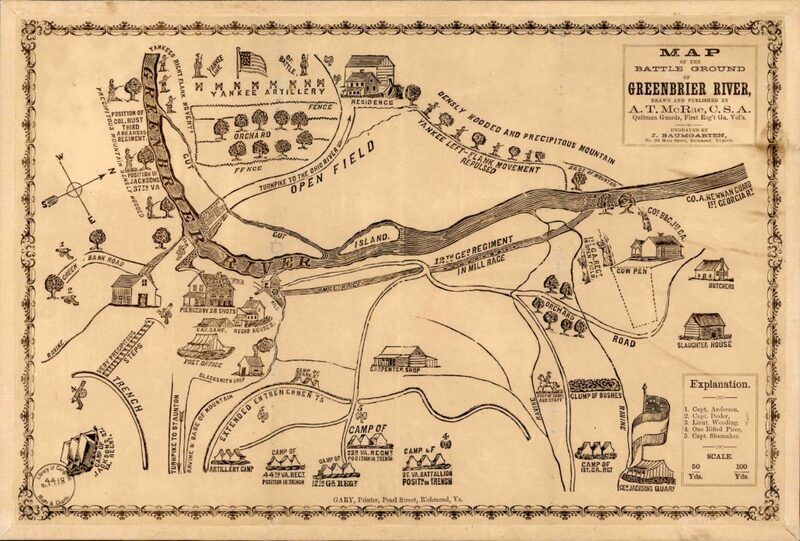 The Battle of Greenbrier River began at 7 a.m. with a blistering barrage of artillery fire from 13 cannons wheeled to the scene by the federal force. More than 1,200 rounds of shot and shell from the Union gunners fell on the encampment, which the Confederates were unable to match with their six cannons, according to Lesser. Despite the superior amount of personnel and firepower available to Reynolds, his Union force was unable to cross the East Fork of the Greenbrier and engage the Confederate force in an infantry battle due to stubborn resistance by Jackson’s men. With ammunition running low and Confederate reinforcements expected, incorrectly, to be arriving soon, Reynolds broke off the attack and marched his force back to Cheat Summit. Casualties from the battle, which mainly were the result of artillery fire, were eight dead and 35 wounded for the Union force, while the Confederates suffered six dead and 33 wounded. “The protective earthworks built by the Confederates prevented many more men from being killed or wounded,” Lesser said. The Union troops, subjected to a fraction of the cannonading targeting Camp Bartow’s occupants, took cover behind trees, fence rows and natural embankments to avoid shrapnel. Infantry from opposing sides were positioned so far apart during the engagement that small arms fire was ineffective. Travellers Repose was perforated by 28 cannonballs during the battle, according to a 2012 Goldenseal article. Tentative plans call for building a parking area and pathway leading visitors to the features remaining on the landscape from the property’s time as Camp Bartow, including a grove of mature white oak trees shading Confederate entrenchments, a leveled-out site for tents where the 31st Virginia Infantry, which included a number of soldiers from the local area, once camped. Signs explaining the earthworks, encampment, battle and its significance are expected to be placed in the parking area and along the pathway. “I am very proud that the story and lessons of this site will be preserved and available for all to visit and learn,” Berdine said. A public tour of the property is scheduled for Aug. 12, hosted by the West Virginia Land Trust and led by Lesser. 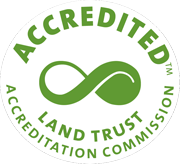 Those interested in attending are urged to visit www.wvlandtrust.org and sign up to receive the Land Trust’s newsletter.